A small after-school program, branded i.am College Track in homage to founding partner musician will.i.am and his i.am angel foundation, launched in Boyle Heights four years ago with 45 students. Last week it graduated all 45 of them. At a ceremony and reception hosted by College Track Los Angeles’ Advisory Board last Thursday, local leaders Los Angeles Mayor Eric Garcetti, City Councilman Jose Huizar, together with celebrity guest will.i.am, gathered with students, parents and College Track leadership to celebrate the class of 2016. 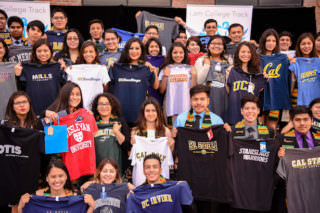 Fully half of students from Boyle Heights never complete high school, and only 5 percent of Boyle Heights residents hold a four-year college degree. 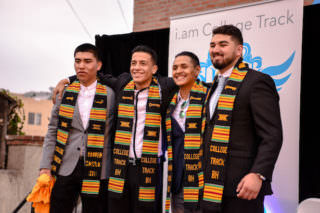 But with a dedicated staff and program model that blends comprehensive academic support and leadership training with college counseling and financial aid advising, 100 percent of i.am College Track’s inaugural class of Roosevelt High School students are bound for college in the fall. Adela is headed to Whittier College this fall with a $28,000 annual scholarship. Laurene Powell Jobs and Carlos Watson founded College Track in 1997, after discovering that many students aspiring to be the first in their families to attend college had a hard time getting the support and guidance they needed to get there. Beginning in the summer before ninth grade, College Track sets promising students from underserved communities on a 10-year path toward college graduation. Today, 93 percent of College Track’s high school students are accepted to four-year colleges. Moreover, College Track students graduate from college at a rate that is 2.5 times the national average of low-income students. i.am College Track Boyle Heights is one of eight sites College Track operates nationwide, and one of two in Los Angeles — a second center launched in Watts in November. To date, College Track has helped more than 2,400 students in eight communities nationwide, and this summer the program will open its ninth center in Denver.